In a bizarre turn of events, Dean Hart is slowly recuperating from his July 20 fall onto New York City subway tracks, but the firefighters who carried him to safety are reeling from critical injuries they suffered hours later when struck by a taxi. Now, Hart, 48, is acting to help Manhattan Rescue 1 firefighters John Walters, 37, and Mike Schunk, 41, who helped him that day, by setting up scholarship funds for their families. On the day of the incident, Hart, heading uptown, was standing on the subway tracks at 57th Street and Seventh Avenue when he passed out from dehydration and fell. The firefighters carried Hart out of the station after a good Samaritan, Sonia Delgado, pulled him off the tracks. A few hours later, Schunk and Walters were picking up dinner when a cab slammed into them. Schunk, of Long Beach, a 12-year FDNY veteran and the married father of a 2-year-old girl, had his right tibia broken, requiring that a rod be placed in his leg. 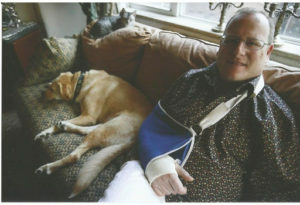 Walters, an 11-year veteran, had his right leg amputated after it was mangled in the accident. He remains in critical condition at Bellevue Hospital Center in Manhattan, family members said. No charges were filed against the taxi driver, Mohammed Ali Khamis, 45.